Why should I consider The Watchman? If you are one of the five million Americans who suffers from Atrial Fibrillation (AFib), the WATCHMAN™ could be the help you need. The WATCHMAN™ offers a lifelong alternative to the use of warfarin for individuals with AFib not caused by a heart valve problem (also known as non-valvular AFib). How does The Watchman work? To understand how the WATCHMAN™ works, it helps to know more about the connection between atrial fibrillation and stroke. Atrial fibrillation, or AFib, affects your heart’s ability to pump blood normally. This can cause blood to pool in an area of the heart called the left atrial appendage, or LAA. There, blood cells can stick together and form a clot. When a blood clot escapes from the LAA and travels to another part of the body, it can cut off the blood supply to the brain, causing a stroke. 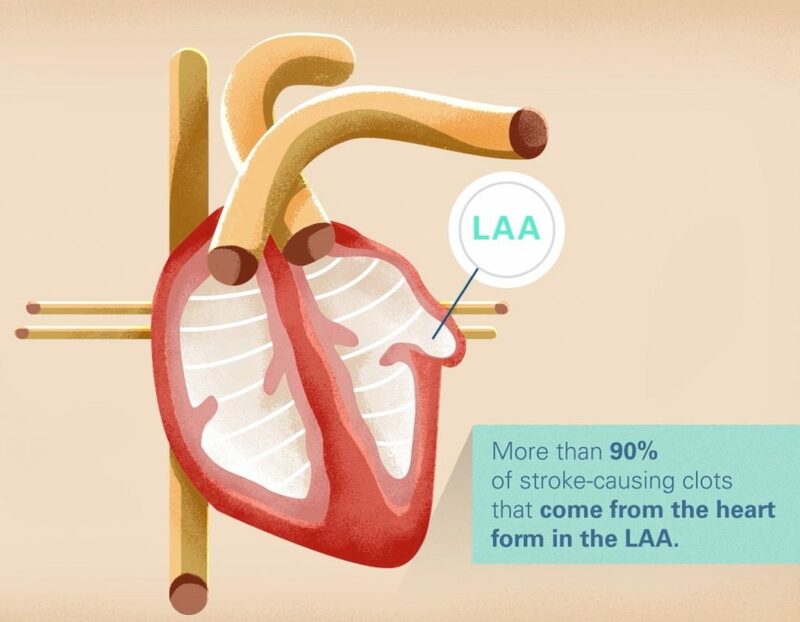 In people with AFib not caused by a heart valve problem, more than 90% of stroke-causing clots that come from the heart are formed in the LAA. That’s why closing off this part of the heart is an effective way to reduce stroke risk. The WATCHMAN™ implant fits right into your LAA. It’s designed to permanently close it off and keep those blood clots from escaping. The WATCHMAN™ is about the size of a quarter and made from very light, compact materials commonly used in many other medical implants. The WATCHMAN™ is implanted into your heart via a one-time procedure. It’s a permanent device that doesn’t have to be replaced and that can’t be seen outside the body. To implant the WATCHMAN™, your doctor makes a small cut in your upper leg and inserts a narrow tube, as done in a standard stent procedure. Your doctor then guides the WATCHMAN™ into the left atrial appendage (LAA) of your heart. The procedure is done under general anesthesia and takes about one hour. Patients commonly stay in the hospital overnight and leave the next day. Due to the risk of having a medical procedure, patients should not be considered for the WATCHMAN™ if they are doing well and expect to continue doing well on blood-thinners. The WATCHMAN™ is the only device of its kind approved by the U.S. Food and Drug Administration (FDA) for reducing the risk of stroke in people with atrial fibrillation not caused by a heart valve problem. More than 30,000 WATCHMAN™ procedures have been performed worldwide. With over 10 years of U.S. clinical studies behind it, the WATCHMAN™ has a proven safety record. In a clinical trial, the WATCHMAN™ was implanted successfully in 95% of patients. In the remaining 5%, the procedure was either not attempted or not completed. This was because a pre-procedure exam showed that the patient was not qualified to receive the implant or because a complication occurred during the procedure before the WATCHMAN™ was implanted. As with any medical procedure, there are risks involved with the WATCHMAN™. Ask your cardiologist about the risks and benefits of the WATCHMAN™. The medical information on this website should not be a substitute for physician consultation, diagnosis, or treatment. All content including text, images, and information contained on or through this site is provided for informational purposes only. You are encouraged to confirm information with other sources and review all information regarding medical conditions or treatments with your physician. Please consult your physician, or contact ACS for an appointment, before making any healthcare decisions regarding a specific condition or treatment. © 2017 Advanced Cardiovascular Specialists. All rights reserved. Website maintained by RP Agency.